With the population of Dallas, Texas, expected to double over the next 20 years, the Texas Department of Transportation (TxDOT) faces the challenge of providing the transportation infrastructure that will support that growth. Their answer? Project Pegasus. This initiative aims to transform the two major Interstate freeways that serve downtown Dallas, redesigning portions of IH 30 and IH 35E. As part of an American Association of State Highway and Transportation Officials and Federal Highway Administration (FHWA) initiative known as Accelerated Construction Technology Transfer (ACTT), a workshop was held in Mesquite, Texas, from September 9-11, 2003, to focus on strategies for accelerating the 19.3-km (12-mi) Project Pegasus. The workshop brought together local and national transportation experts from State highway agencies, industry, academia, and FHWA. These experts' skill areas included design, construction, innovative financing, right-of-way, utilities, innovative contracting, the environment, work zone traffic control, and worker safety. The portions of the IH 30/IH 35E freeways being rebuilt as Project Pegasus are critically congested, with bumper-to-bumper traffic occurring for more than 6 hours a day and traffic speed averaging only 32 km/h (20 mi/h). The traffic problems are exacerbated by the outdated layout of the freeways, which were primarily designed in the 1950s to take travelers to downtown Dallas. Travel patterns have changed over the decades, however, and today four out of every five drivers remain on the freeways and bypass downtown Dallas. 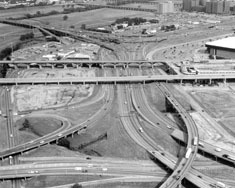 Design standards have also changed over the years: In many locations on the freeways, ramps lack adequate acceleration or deceleration lengths, interchanges and ramps are too close together, and bridges have limited vertical and horizontal clearances, among other problems. The reconstruction project will add capacity, with plans calling for five to six lanes in each direction and one or two reversible high-occupancy vehicle (HOV) lanes in the median. Operations and safety will also be improved by upgrading to meet today's design standards for freeways, as well as by eliminating left hand merges and diverges. Maintain traffic with minimal disruption. Accommodate special events in the region. Provide access to emergency facilities. Maintain a safe work zone. Minimize construction delays due to right-of-way, utilities, and railroad issues. Incorporate a context-sensitive design into project plans. Don Lucas of the Heritage Group and chair of the Transportation Research Board (TRB) Committee A5T60, the Task Force on Accelerating Innovation in the Highway Industry, noted that customers are demanding a response to their travel needs. "The momentum is building for change. We need to share innovative practices and processes with each other to create a new picture of how we can perform high-speed construction while maintaining the quality." Project Pegasus will transform the two major Interstate freeways that serve downtown Dallas, IH 30 and IH 35E. "Acceleration is a priority topic for DOTs," added Hal Kassoff of Parsons Brinckerhoff and also a member of the TRB task force. Tim Nesbitt, project manager for TxDOT, noted that challenges faced by TxDOT in accelerating the project include having to weave construction around railroad tracks, major employment sites, four city parks, the Dealey Plaza historic district, American Airlines Center, and a new proposed stadium site for the Dallas Cowboys. Workshop participants met in smaller skill set groups to brainstorm issues and ideas and develop recommendations for meeting the project goals and working through the challenges. Recommendations for accelerating the project included using design-build contracting to optimize innovation, coordinating with utility companies early in the project planning process, and using long-life pavements with a 50-year design life. Other recommendations included employing construction techniques for structures that minimize the traffic impact, such as incremental launching, lateral slide, and heavy lift methods; improving general materials specifications to only allow use of premium materials; using contractor incentives to minimize traffic disruption; and setting up a dedicated incident management system at the project site. 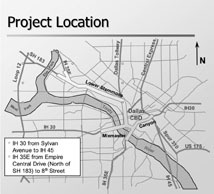 Additional traffic management suggestions included constructing the planned Trinity Parkway west of I-35E prior to this project, so that mainline traffic can be detoured onto the Parkway. This will enable such traffic strategies as total or partial road closure, weekend closures, or restricting road use to HOV vehicles only, to be used. The importance of providing information to the public was emphasized, as workshop participants noted that real-time traveler information should be provided and that project work should be supported by intensive media efforts to let residents and the community know about the changes taking place. The AASHTO/FHWA ACTT team is developing a report on the workshop and will then compile 6-month and 1-year follow-up reports detailing which of the workshop recommendations were implemented and to what extent. Support for the ACTT initiative is steadily gaining momentum. The next workshop will be hosted by the California Department of Transportation in December. Louisiana, Montana, Oklahoma, and Washington State have all indicated that they are interested in hosting workshops in 2004, while States such as Georgia, Idaho, Maryland, Massachusetts, Minnesota, New Jersey, and Wisconsin have also expressed interest in the ACTT program. To learn more about Project Pegasus, contact Brian Barth at TxDOT, 214-320-6189, or visit the project Web site at www.projectpegasus.org. For more information on ACTT or to learn more about hosting a workshop in your State, contact your local FHWA Division Office or Dan Sanayi at FHWA, 202-493-0551 (email: dan.sanayi@fhwa.dot.gov).